Withering but persistent and not falling. Pertaining to the edge of a structure. Wetlands dominated by herbaceous vegetation such as grasses, reeds or sedges. Open, sunny fields vegetated primarily by grass and other non-woody plants. 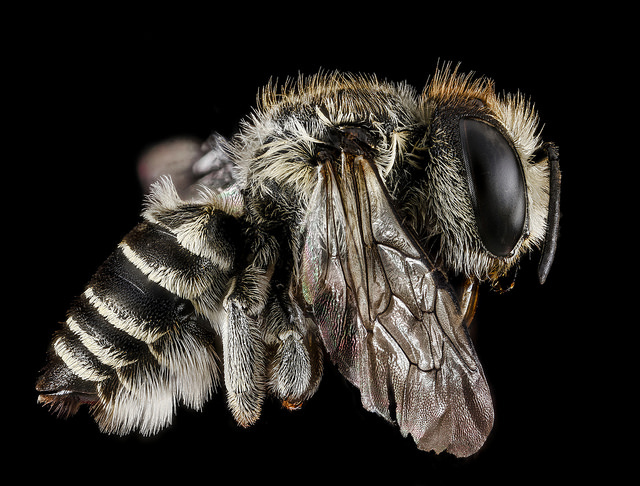 Leaf-cutter Bee, photo USGS Native Bee Inventory and Monitoring Laboratory. 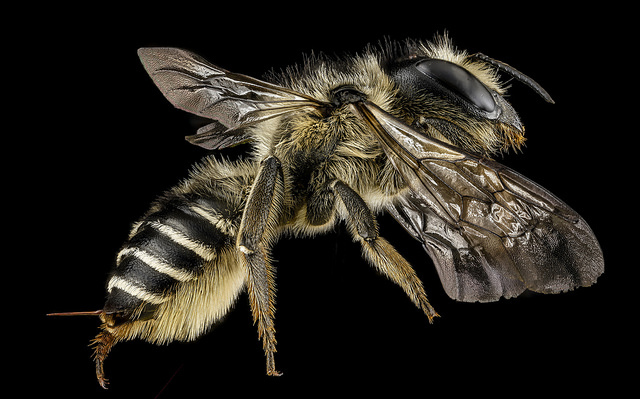 Unarmed Leaf-cutter Bee, photo ©Sierra Williams, USGS Native Bee Inventory and Monitoring Laboratory. 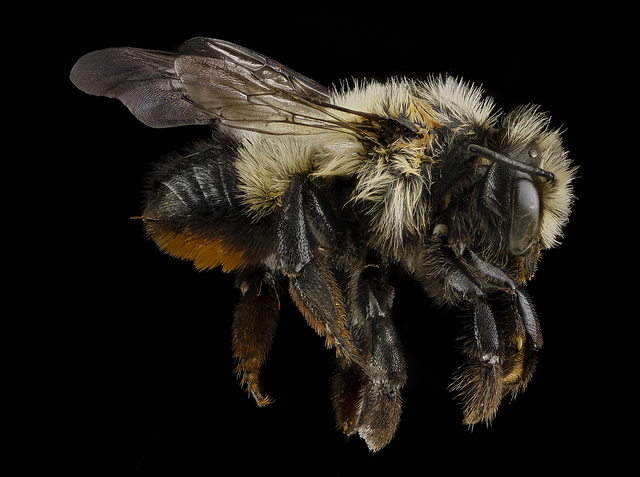 Fuzzy-legged Leaf-cutter Bee, photo ©Sierra Williams, USGS Native Bee Inventory and Monitoring Laboratory. In species that produce two kinds of spore (e.g., Isoetes, Selaginella, Azolla, Marsilea), the larger spore that gives rise to the "female", egg-producing gametophyte. 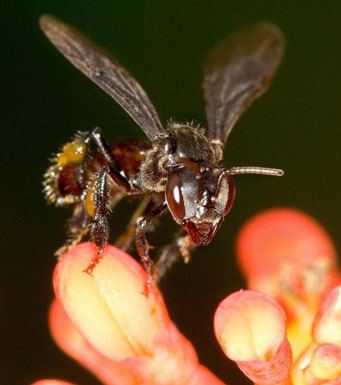 Stingless Bee, photo ©David Cappaert, Michigan State University, Bugwood.org. Thin, flexible, almost translucent; like a membrane or film. A 'chin-like' projection at the base of the flower, made up of the column and the sepals. A single-carpellate section of a schizocarp. Having a specified number or multiple of parts. Moist (as in a habitat). Attached at or toward the middle, as in the area where a petiole meets the leaf blade. In species that produce two kinds of spore (e.g., Isoetes, Selaginella, Azolla, Marsilea), the smaller spore that gives rise to the "male", sperm-producing gametophyte. 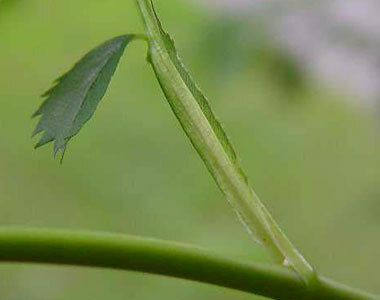 The main vessel of a leaf, the continuation of the petiole; midvein. The biggest vein that runs down the middle of the leaf blade; midrib. With all of the filaments of the stamens joined into a single group. Flowering only once before dying. A 2-flowered cyme with a terminal flower and a single, lateral flower. Perianth comprised of 1 series of parts, as in a single whorl of sepals or petals. A flowering plant with embryos that produce only one seed leaf (compare "dicotyledon" or "dicot"); monocotyledon. A plant that bears some flowers with pollen-bearing organs (stamens) and separate flowers with ovule-bearing organs (carpels). Where a tubular structure such as a flower opens up into lateral lobes. A slimy or snot-like excretion, rich in heavy starches. A short, abrupt projecting tip. Ending abruptly in a short, stiff point. 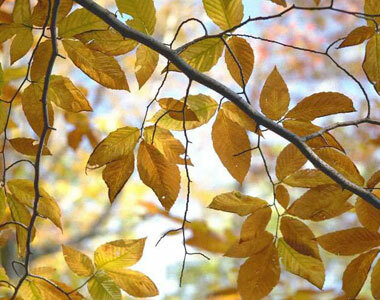 Plants with little or no chlorophyll that depend on fungi, not photosynthesis, for carbon and other nutrients.